If you’ve gotten past the novice stages of selling promotional products and apparel online, you might be trying out a new thing here and there. Maybe you’re dabbling in online advertising using a pay-per-click service like Google Adwords, or perhaps you’ve tried developing some unique content of your own to help with your search engine ranking. Maybe you’re even running some local advertising or sponsorships to draw new customer to your web site. If so, you’ll soon start thinking about landing pages. Landing pages are what they sound like – a page on your site where visitors land before they (hopefully) take other actions, such as browsing, buying things, filling out a lead form or giving you a call. Any page on your site can be a landing page, although typically when someone enters your site at a specific product page, their destination is so focused that we don’t call that a landing (often it’s just an “entrance”). In most other cases, though, visitors who arrive at your site need to know that they’ve arrived at the right place. Thus, a landing page might be a listing of products (a category page, for instance) that the user was searching for, a page of information specific to their search, or even a form that addresses their need in specific terms and asks them to sign up for something or request information. Landing pages can be many different things, but in order to be effective, they need to be welcoming and relevant. Just as you would greet someone entering your retail establishment and ask them what you could help them with, a landing page immediately establishes your relationship with a prospective customer. Your homepage is, in essence your primary landing page. But your homepage has a problem – it has to be all things to all people, all at once. In its role as a general-purpose greeter, your homepage is more like the doorway to a mall – it’s an entrance point for browsing, but not the direct route to what a visitor might be looking for. Landing pages, on the other hand, allow you to tailor content and messaging toward a specific audience or product need. You may sell apparel, promotional products, signage and even printing services, and there may be a few of your visitors that are interested in all of those. But if you have a customer just looking for one of those services, you can build a landing page for each service that speaks to your strengths, service and pricing for that service only. Now, you might protest that you don’t want to get pigeonholed into specific services; you offer everything, and you do it well. That’s fine, and it can be a good message in any number of media. But on the internet, specificity wins. The more you say you do, the less likely you’ll be found for any one thing that you do (there are exceptions to this, obviously, like Amazon, but they are few and far between). That’s because the holy grail for search engines is to offer up the exact content a visitor wants for the search terms they’ve entered. That means that, all other things being equal, a search engine will prefer a page that is very specifically relevant to the search terms a user entered, as opposed to a page with many different products or services. In practice, that means that a search for “travel drinkware” more likely will be directed to a page about “drinkware” or “travel drinkware” rather than a page about promotional products in general (as I said, there are exceptions, especially with companies with extremely high general-product search ranking). What Kind of Pages are These? If you get someone to land directly on a product page, you’ve already won that battle – they’re (most likely) exactly where you want them. But for the rest of your visitors, it’s often beneficial to build or modify key pages on your site so that a “landing” visitor is more likely to stick around and take the action you’d like them to take. As an added benefit, if you’re running pay-per-click advertising, a relevant landing page actually increases your quality score, which reduces you cost per click and improves your ad position. Regular Site Pages: These are the pages on your site that have concentrated content that visitors often search for. For instance, these may be your major category pages (apparel, drinkware, writing instruments, etc.) or the pages where you describe and promote specific services in detail (printing, vehicle wraps, embroidery, etc.). These pages should be regularly maintained, updated and populated with the keywords that best fit the searches for that product or service. Advertising campaign landing pages: If you run an advertising campaign that is likely to attract new customers, rather than just sending them to a page of products, you might want a page that shows them products and (briefly) introduces your company to them. You can tell them a little about your company, your guarantee and so on before diving right into products. Lead Capture landing pages: You might have a product or service that requires followup, estimation or other interaction that you can’t accomplish quickly on a web page. 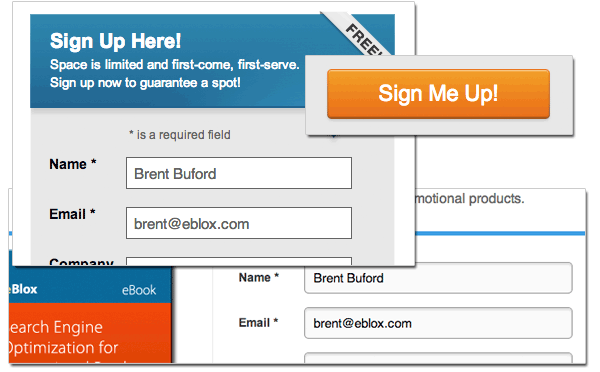 Lead capture landing pages very quickly state the benefits of filling out this form, and ask users for a small amount of information in order to continue the sales process. SEO/Content Landing Pages: If you’re doing SEO work or building content to target a niche or long-tail product area, a landing page with those products and keywords can help you with ranking. We recently built a series of landing pages for very specific products that assisted both with pay-per-click and SEO. Do I Need All This? At the very least, you should maintain and optimize those built-in landing pages on your site, like your category pages. A little bit of keyword research can help you determine what kind of content to put on a given landing page. Good keyword content on your landing pages can improve your rankings for specific terms. But it needs to be balanced with content that welcomes visitors. Don’t go overboard with either; imagine a user coming to a landing page for the first time, and think of a message or description that will entice them to stick around. Custom landing pages are a bit more work, but the payoff can be big, especially with advertising campaigns. For instance, if you are advertising a promotion or discount, your custom landing page can reinforce that messaging and guide a visitor directly into purchasing. You might even advertise to specific audiences, or based on seasonal criteria; the more specific the message, the more important that it be reinforced after someone clicks on the ad. However far you decide to go, make sure you test your landing page strategy with analytics. Many companies see massive improvements in landing page performance with very small changes – a button moved up the page, a color change, a different headline. With analytics (Google Analytics now offers free A/B testing with its Experiments tool), you can fine-tune your landing pages so that they deliver exactly what you want most: more customers. A version of this article also appeared in Identity Marketing magazine.